independent variable. The case of one independent variable is called simple linear regression. For more than one independent variable, the process is called multiple linear regression. In linear regression, the relationships are modeled using linear predictor functions whose unknown model parameters are estimated from the data. Such models are called linear models. 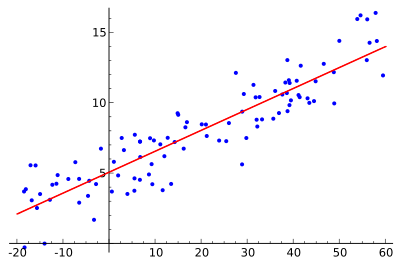 Linear regression is used when to predict things, forecasting, or error reduction in every dataset to observed the values of X and Y. Given a variable y and a number of variables X1, …, Xp that may be related to y, linear regression analysis can be applied to quantify the strength of the relationship between y and the Xj, to assess which Xj may have no relationship with y at all, and to identify which subsets of the Xj contain redundant information about y. Linear regression models are often fitted using the least squares approach. Conversely, the least squares approach can be used to fit models that are not linear models. Thus, although the terms least squares and linear model are closely linked, they are not synonymous. Lets assume simple linear model, in simple linear model there is only one independent variable (X) and one dependent variable (Y).